Habit: Plants in soil [climbing]; rhizome short- to long-creeping to erect, scaly; new growth often +- red. Leaf: of 1 or 2 kinds, fertile, sterile; stipe in ×-section with vascular strands in circle; blade [(simple or 2-pinnate)] deeply pinnately lobed to 1-pinnate, pinnae deeply pinnately lobed or not, hairs generally 0; veins free or netted. Sporangia: sori linear to oblong, along veins parallel to nearest midrib; indusium shaped +- like sorus, opening towards nearest midrib; stalk cells in 2--3 rows; spores elliptic, scar linear. Genera In Family: 24 genera, +- 250 species: worldwide, especially tropics; several species cultivated. Note: Until recently, most species usually treated in an extremely morphologically heterogeneous Blechnum, with some species more closely related to other genera (such as Brainea, Doodia, Sadleria) than to other species of Blechnum. Scientific Editor: Bruce G. Baldwin, Alan R. Smith, Thomas J. Rosatti. Habit: Rhizome prostrate to ascending; scales dense, orange-brown. Leaf: all alike, lower pinnae generally slightly reduced or not; veins of sterile leaves netted but free at margin. Sporangia: sori oblong. Habit: Rhizome prostrate, short, stout. Leaf: evergreen, generally 1--3 m, coarse; stipe generally 5--15 mm wide at base, scales large, orange-brown to straw-colored; pinnae generally 15--30 cm, often glandular, lobed +- to midrib, lower +- reduced. Sporangia: sori generally +- 2--4 mm. Chromosomes: 2n=68. Ecology: Near streams, springs, seeps; Elevation: +- 0--2300 m. Bioregional Distribution: CA-FP (rare GV); Distribution Outside California: to British Columbia, Nevada, Arizona, northwestern Mexico. Synonyms: Woodwardia chamissoi Brack. 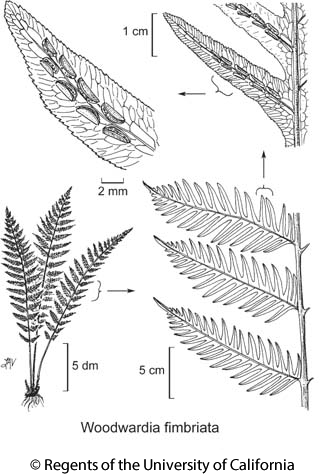 ; Woodwardia radicans (L.) Sm., misappl. Citation for this treatment: John C. Game, Alan R. Smith & Thomas Lemieux 2012, Woodwardia fimbriata, in Jepson Flora Project (eds.) Jepson eFlora, http://ucjeps.berkeley.edu/eflora/eflora_display.php?tid=48619, accessed on April 21, 2019. CA-FP (rare GV); Markers link to CCH specimen records. Yellow markers indicate records that may provide evidence for eFlora range revision or may have georeferencing or identification issues. Purple markers indicate specimens collected from a garden, greenhouse, or other non-wild location.